The celebration continued last week when organizers announced the seventh annual race hit a major milestone: more than $500,000 in funds. 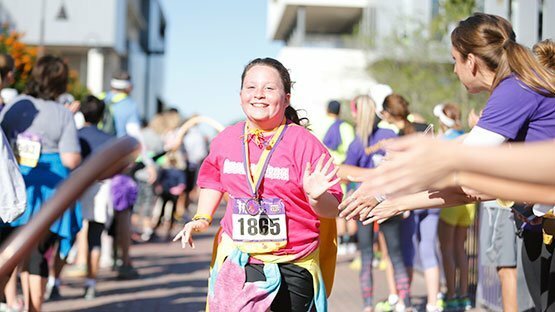 When the army of children wearing gold cancer-fighting superhero capes crossed the finish line at Grand Canyon University Foundation’s Run to Fight Children’s Cancer last month, onlookers greeted them with cheers, tears and high-fives. The celebration continued last week when organizers announced the seventh annual race hit a major milestone: more than $500,000 in funds raised for lifesaving treatments and research, along with financial and social support for families battling the disease. “Reaching the half-million-dollar-mark strengthens our resolve to help families facing the nightmare of childhood cancer,” said Debbie Accomazzo, race director. Accomazzo said the race is critical because childhood cancer is one of the most overlooked and underfunded categories of all cancer research. Nationally, nearly 16,000 children from birth to age 19 are diagnosed with cancer each year, and the disease kills more kids than AIDS, asthma, diabetes, cystic fibrosis and congenital anomalies combined. The 2017 event, which took place on March 11 at GCU’s west Phoenix campus, raised $90,000 for Phoenix Children’s Hospital and Children’s Cancer Network. The hospital has earmarked the funds for its new Center for Cancer and Blood Disorders slated to open in October. For Children’s Cancer Network, the proceeds will help families with services not covered by insurance and also increase funding for a much-needed mental health therapist who provides free counseling to children and families at PCH. The festival-style event attracted more than 2,000 runners for the 10K and 5K races, along with hundreds of spectators and volunteers. Nearly 100 cancer survivors participated in the quarter-mile Cancer Survivor’s Walk, which honors children who have beaten the disease, those who are still fighting, and those who lost their battle with cancer. Pono Construction, the company responsible for the building campaign on GCU’s campus, served as the race’s grand presenting sponsor. The race also featured dozens of fundraising teams, the largest of which was Stronger Together, which secured $12,000 in online donations and rallied 147 runners to support Chaparral High School students Kaitlin Slepain and Lauren Kettell, who are battling cancer together. Grand Canyon University Foundation is an independent non-profit 501(c)(3) public charity whose mission is to embrace the generosity of the Christian spirit by making donations in the communities in which the students, faculty/staff and friends of Grand Canyon University live, work and serve. For more information about the run, visit www.runtofightcancer.com. Children’s Cancer Network is a 501c3 non-profit organization dedicated to providing assistance to Arizona families dealing with childhood cancer. Established in 2004, the organization lends financial support to families, promotes patient and family education about cancer-related issues, and sponsors activities that build the self-esteem of childhood cancer patients and their siblings. Children’s Cancer Network is committed to helping children and families dealing with the stressful and uncertain times that begin with initial diagnosis and often continue for years thereafter. Visit www.childrenscancernetwork.org for more information.